Prime Minister of the Bahamas Hubert Ingraham (r) Prime Minister of Trinidad and Tobago Patrick Manning at the opening session of teh summit. The same week Amnesty International released its latest report on the monstrous rate of killings in Jamaica, Caribbean Community (CARICOM) heads of government met in special session in Trinidad to discuss crime and security issues confronting the Anglophone Caribbean integration movement that has expanded to include Haiti (French) and Suriname (Dutch). For a bit spice, it was also the week a Jamaican permanent resident of the United States and former US soldier was arrested in a Florida airport preparing to board a flight with what was considered bomb-making material. That 33-year-old Kevin Brown was described by friends as being of unsound mind does not deviate from the threat he could have posed to the society and himself. While it is obvious that the heads clearly understood the context of their need to meet, it’s not as crystal from the heavy bias towards crime fighting measures, such as beefing up police and military security, that the underlying social issues are being tackled with equal alacrity. 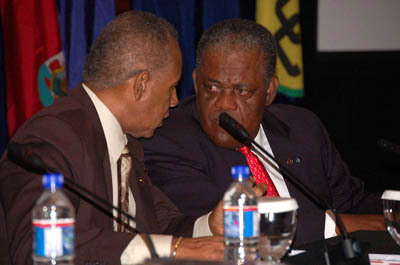 It was presaged by an extraordinary meeting of the Standing Committees of Commissioners of Police and Military Chiefs, which took place in Guyana through Holy Thursday and Good Friday, and one by the Security Policy and Advisory Committee (SEPAC) and of the Council of Ministers of National Security and Law Enforcement which met in Port-of-Spain the four preceding days. The special heads conference, called at the instigation of Trinidad and Tobago’s Prime Minister Patrick Manning came against the background and cognizance of a growing wave of crime that has tormented particularly the larger economies and population centres of the region as well as an internationally troubled economic and political climate. “The Region is challenged on several fronts today. There is the rising cost of living triggered primarily by the high cost of fuel,” Bahamas Prime Minister Hubert Ingraham told his colleagues at the opening of the meeting in Port of Spain. “The instability in global financial markets and the tightening credit situation are negatively impacting the flow of capital and investment in the region. The weakening global economy has already begun to impact our tourism sectors. The conference agreed to tackle crime under 10 major headings, from Maritime and Airspace Security Cooperation, through the deportation if hardened criminals from developed countries. Crime Prevention and Gang and Youth Related Violence, came it as points seven and eight just ahead of Kidnapping and the Deportees issue. (2) for Gang and Youth Related Violence – the development of monitoring capability, intelligence monitoring and analytic capacity on gang related activity nationally and regionally. There can be no doubt that appropriate policing tools are crucial both in the fight and prevention of crime and the corruption which is hinted at in the polygraph machinery; but the preponderance of the battle stance even in the face of Jamaica’s 300-plus murders for the year so far and Guyana’s brutal double massacre of more than 20 people in a small village, does not offer a future of much hope. Authoritarianism and its corollary bureaucracy, are cancers which thrive on themselves: when authority fails, it is because enough was not applied in the first instance so more is applied and the ultimate outcome in such scenarios is totalitarianism. The antithesis to this is anarchic revolt that paralyses stability and hope for progress. Grenada had a cathartic outburst when Maurice Bishop’s New Jewel Movement toppled Eric Gairy and his idiosyncrasies in 1979; Trinidad had one when Yasin Abu Bakr seized parliament in 1990. In both instances political and religious forces were seen to be operating in the criminal realm and dealt with accordingly. Far from suggesting that extrajudicial measures should be allowed to prevail, it is the contended in some quarters that it is the absence of justice in sufficient quantities and the poor quality of existence that foments such activities and the garrison politics of Jamaica that results in the greatest proportion of the 1,500 murders a year, is part of a cycle of dehumanization and denial of rights (to vote or not to vote, to leave or not to leave, to work or not to work). If our political leaders can design the instruments to be prescriptive in combating the symptoms of crime sans the common legal system as promulgated in the Caribbean Court of Justice, it should be just as acceptable for them to speak to preventive methods to address the sociologies that spawn violence and corruption, through models than can be tailored for the unique communities.